The cancer’s wall is an aggregate of abnormal cells existing around cancer cells. Cancer cells try to inhibit the attack by the patients’ immune cells in many ways in order to protect itself and spread its power, i.e. cancer builds the wall surrounding itself and blocks the approach of immune cells. In case the effect of immunotherapy is weak or it does not work, this cancer’s wall may disturb the therapy. The PremiereClinic offers personalized treatments in order to break the cancer’s wall. At first the condition of each patient needs to be checked. *1　What is anti PD-1 antibody (Nivolumab) ? It is an immune system modified medication and is expected to bring new hope to cancer patients as a new immunotherapy drug. PD-1 (programmed cell death 1) is a cell surface receptor that belongs to the immunoglobulin superfamily and is expressed on T cells playing an important role to get rid of cancer cells. PD-L1 (programmed cell death ligand-1) binds to its receptor PD-1, found activated T cell, to modulate activation or inhabitation. Nivolumab is a drug to inhibit the binds between PD-1 and PD-L1 and to make T cell function healthy. It does not attack cancer cells directly. It is a type of cancer treatment drug to enhance your immune system. These days there is great competition in the pharmaceutical industry to develop antibody drugs related to PD-1. Notice: There are some risks of interstitial pneumonia etc or necessity of temporary hospitalization in use of Nivolumab. We will do the treatment only when patients understand and accept the condition. In Step 1: The therapy weakens the cancer’s cell and allows the immune cells to come closer to the cancer cells. The immunotherapy is expected to work well under these conditions. In Step 2: The fluctuating style of molecular targeted dendritic cell therapy and super unique lymphocyte blazing therapy sharp-shoots cancer. 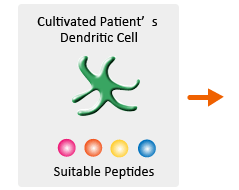 The top 4kinds of peptides react strongly (based on the information of blood of cancer patients) with dendritic cells and are returned to the body of patients. 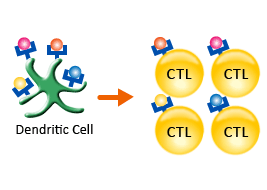 The dendritic cells returned to the body convey the information of cancer cells to CTL (T killer cell). 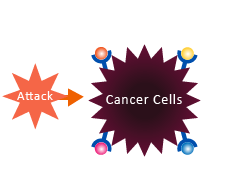 The peptides suitable to the patients attack cancer cells in a specific way. By investigating the peptides suitable to the patients over time, it is able to meet the change of antigen and keep attacking cancer cells. 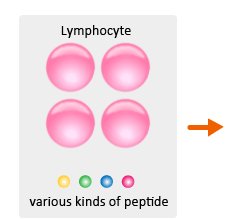 Lymphocyte stimulated by the selected peptides is cultivated individually. 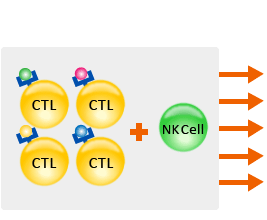 Furthermore the activated NK cells are added to the lymphocyte and returned to the body of the patient, which is programmed to benefit the cancer cells hiding their signals. 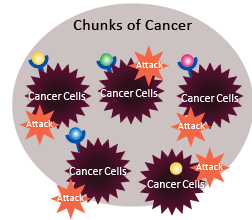 It attacks various cancer cells in chunks of cancer.